Introducing Apple Watch Series 4. Fundamentally redesigned and re-engineered to help you stay even more active, healthy, and connected. The largest Apple Watch displays yet. New electrical heart sensor. Re-engineered digital Crown with haptic feedback. Entirely familiar, yet completely new, Apple Watch Series 4 reset the standard for what a watch can be. Part guardian, part guru. ECG on your wrist. Low and high heart rate notifications. Fall detection and emergency SOS. New breathe watch faces. It’s designed to improve your health every day. Workouts that work harder. Automatic workout detection. New yoga and hiking workouts. Advanced features for runners like Cadence and pace alerts. Comprehensive activity tracker that is made to motivate. New head-to-head competitions. Activity sharing with friends. Personalized coaching. Monthly challenges. Achievement awards. Built-in cellular lets you do it all on your watch -even while you’re away from your phone. Intense performance meets precision timepiece in the Fenix 5X Plus multisport GPS watch. For athletes and outdoor adventurers, this ultra-rugged watch features routable color TOPO maps, estimated heart rate at the wrist, Pulse Ox Acclimation, a non-medical device that provides estimated blood oxygen saturation awareness, storage for up to 500 songs and the Garmin Pay contactless payment solution (available for supported cards from participating banks). 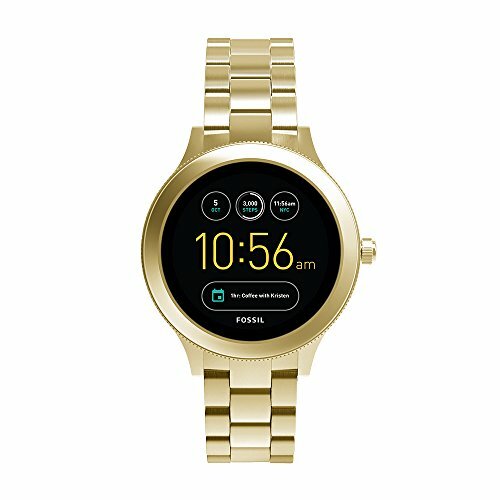 Upgrade 4G smartwatch: Built-in Android 7.1 operating system contains 1GB + 16GB of memory, supports 4G, 3G, 2G network, You can install the applications which you use frequently. Like online shopping app, a translation app, trip app and entertainment app etc. Simple and sporty design: LTPS screen, Replace surface theme, Easy to disassemble silicone and leather strap, Whether at the stadium or in the conference room, it’s perfectly suitable for your wrist. Equipped with 2.03 inch Screen & 8MP Camera: has an AMOLED HD big screen which makes it easier and more convenient to operate. With 8 million megapixel HD camera, no matter you are in friends party or journey, you can clearly record. Satisfaction Guarantee: Your satisfaction is our greatest happiness, come to buy, more features waiting for you!! The only full-screen Wear OS smartwatch with mechanical hands, the LG Watch W7’s premium stainless-steel design features the same quality materials you would find on most high-end timepieces, and its 1.2″ screen allows for easy viewing and touches control. Always know what time it is with mechanical hands with precision movement developed in partnership with Soprod SA, a Swiss company. Get up to 100 days between charges in Just Watch Mode. In full operation mode on a single charge, the Watch W7 can run for up to two days and then an additional three to four days in analog-only mode. In the mechanical watch-only mode with its smart features disabled, the watch can operate for up to 100 days, or more than three months before requiring a charge. Choose from a selection of unique watch faces optimized to take advantage of the mechanical hands and designed to fit your personality, mood, and current activity. Dust and water are not a concern. Wear the IP68-rated LG Watch W7 worry free in up to one meter of water for up to 30 minutes*. Also, it is sealed against damage that can be caused by dust and dirt. You, At a glance – Because it’s on your wrist, Apple Watch lets you receive notifications immediately and conveniently. The moment the people or apps you care about have something to say, you’ll feel a gentle tap. Throughout the day, Apple Watch measures your workouts, tracks your activity, and helps encourage healthy routines. We designed Apple Watch to reflect a wide range of tastes and styles. Stay connected in style with the 38mm Apple Watch Series 2, which comes with Space Black stainless steel chassis and a Space Black link stainless steel band. Designed for users looking for the next generation of connectivity, Apple’s Watch moves your iPhone’s apps and functions to your wrist, so you can do more while leaving your phone in your pocket. Activity and Heart Rate Monitor featuring Built-in GPS and 50M water-resistance keep you active and motivated and connected for a healthy life. Digital crown navigates the new Watch OS3 with the support of the app store featuring workout Apps which offer a guide to meditation and training applications. All-day Siri assistant offers app notifications and wireless connection through Bluetooth. SPECIAL: 2 Year Extended Warranty! Protect Your Purchase! Meet the timepiece that’s fashion’s last word in wearable tech. Personalize the touchscreen to match your mood, receive updates from your social circle, track your fitness goals and more. A smartwatch that (actually) looks the part. With a new full-round digital display, our Q Venture offers multiple features like customizable faces, discreet notifications and automatic activity tracking to help make your life easier—and a bit more stylish. Smartwatches built with Wear OS by Google are compatible with iPhone and Android phones. Wear OS by Google and other related marks are trademarks of Google LLC. Touchscreen smartwatches built with Wear OS by Google require a phone running Android OS 4.4+ (excluding Go edition) or iOS 9.3+. Supported features may vary between platforms. To avoid damage to your watch, only use with the included charger. Do not use a USB hub, USB splitter, USB y-cable, battery pack or another peripheral device to charge. Wear OS by Google and other related marks are trademarks of Google LLC. Touchscreen smartwatches built with Wear OS by Google require a phone running Android OS 4.4+ (excluding Go edition) or iOS 9.3+. Supported features may vary between platforms. iPhone users cannot respond to messages or app notifications from the watch. iPhone users cannot ask Google Assistant for directions. The watch will only receive push notifications from navigation apps activated on the iPhone. To avoid damage to your watch, only use with included charger. Do not use a USB hub, USB splitter, USB y-cable, battery pack or another peripheral device to charge.